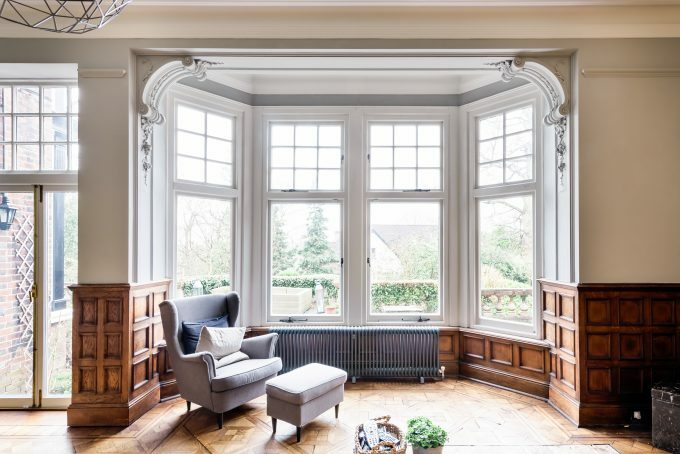 Awash with period details such as original panelling, intricate cornicing and heavy cast iron radiators, the living room in this Edwardian mansion was breathtaking. It’s wide angled bay was the perfect spot for us to show off the benefits of our Tier-on-Tier shutters. 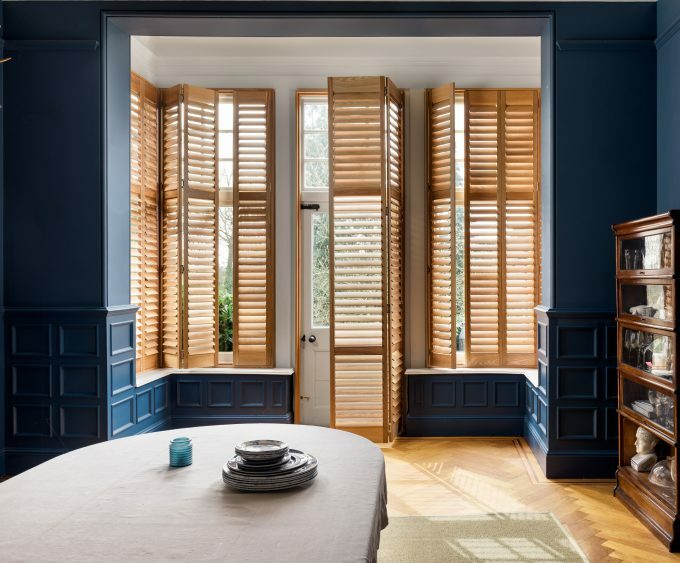 Any window dressing other than shutters would have hidden the shape and lines natural to the architecture of this stunning home, and the homeowner was thrilled when she saw how practical – and stylish – the end result was. We installed our Classic Poplar Tier-on-Tier shutters in Bright White to this angled bay. Choosing tier-on-tier gave us the option to keep the grid detailing either exposed or hidden. The flexibility of having two different tiers also allowed us to maximise light entering the room while keeping the bottom tier closed to retain privacy. For extra light control we simply adjusted the louvres in the bottom tier. Every detail was considered to get the perfect look to accentuate this traditional home. 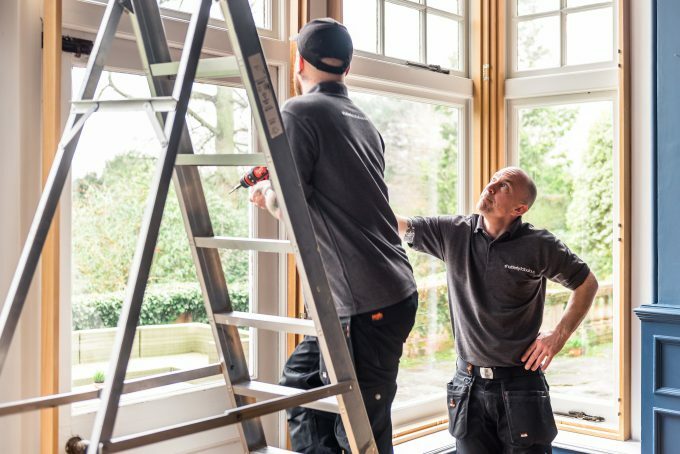 We specifically chose hidden pushrods for this window to keep the look fuss-free and minimal, as there were lots of lines and symmetry featured in different areas of the room as it was. We opted for one of our standard colours, Bright white, to bounce light around the room and contrast against the wooden panelling. Get this look in your home: Tier-on-tier Classic Poplar Shutters in Bright white, 76mm slats, with hidden pushrods. 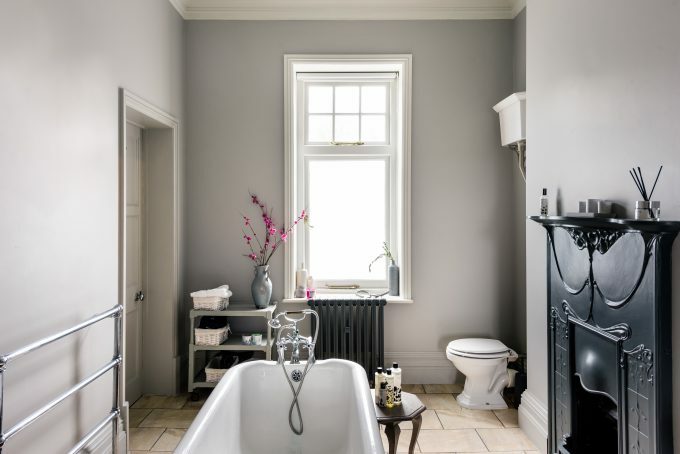 As many other homeowners with bathrooms sympathetic to the Edwardian era will know about, most of the day the room has limited natural light entering the room. The bath being situated in the centre of the room in perfect alignment with the window also meant privacy was an issue for the homeowner. As a temporary fix the homeowner rectified this by using a frosted window covering. Fine for daytime bathing, but this can still reveal shadows to passers by when the lights in the bathroom are switched on and it’s dark outside. Blinds and curtains not an option, this was the perfect room for us to showcase the benefits of our cafe style shutters. We fitted our Waterproof Polyvinyl cafe style shutters in Bright white to this bathroom window – the strongest choice of our styles for many reasons. 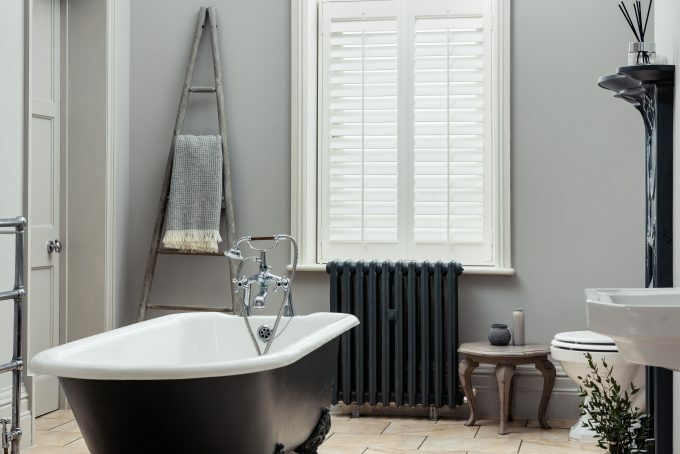 Specifically made for steamy bathrooms and kitchens, our polyvinyl shutter range is impervious to moisture and anti-warping. To make the most of light at all times of day, installing cafe-style shutters instead of full height shutters meant that the top of the window would be constantly exposed, yet the bottom still provides ample privacy. In this instance, cafe style shutters have made a focal point of the grid detailing common in period sash windows and tackled the homeowner’s window dressing issues of privacy and light head on. Get the look in your home: Cafe style Waterproof Polyvinyl shutters in Bright white, 76mm slats, with central pushrods. t’s often forgotten that shutters make a good window dressing solution for patio or French doors. Doors left without window dressing look completely acceptable, but doors dressed with shutters look sensational. Key for this room was to make it feel less narrow while giving it a practical focal point in keeping with the traditional features of the room. We were excited to dress it in shutters from our Elm range. 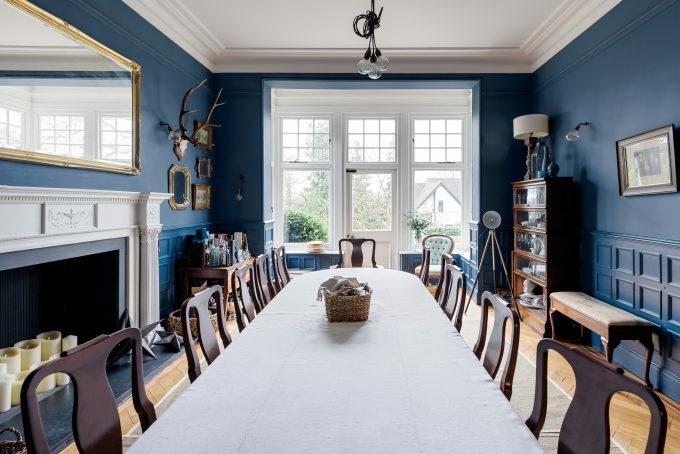 We chose to fit our Premium Elm Wood range in Natural stain to the dining room windows and door to give the room instant warmth and even more charm. We purposefully opted for a darker shutter rather than white in this room which was great for making a focal point of the width rather than its narrowness. 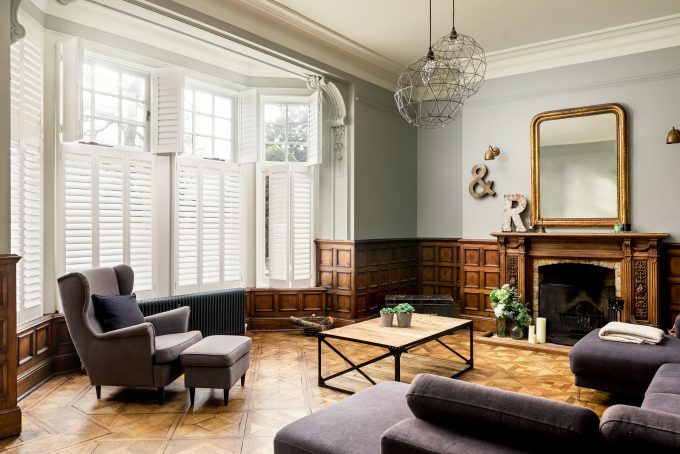 White shutters are great for elongating rooms, ideal for small or large spaces whereas Natural Elm’s darker contrast gives the illusion of the doors and windows appearing closer as we entered the room, offering a cosy look. On cold evenings, we imagined this room being full of guests with our shutters setting a cosy backdrop to the scene. Get the look in your home: Full height Premium Elm shutters in Natural, 76mm slats, with hidden pushrods. Always a tricky room to decide on window dressing for, kitchen diner window treatments need to strike a balance between cosy and practical. 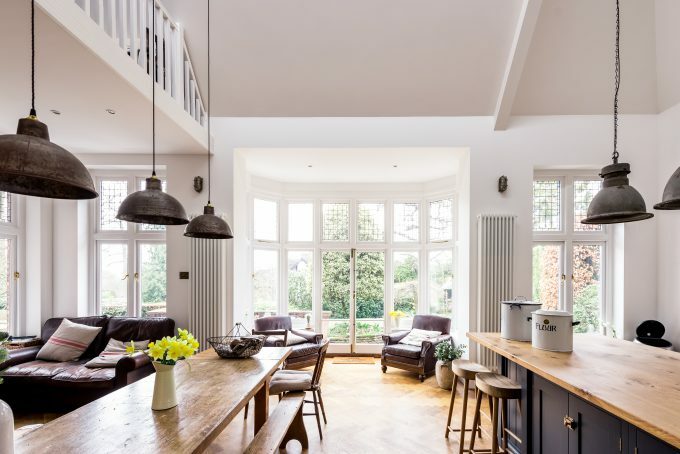 The kitchen diner in this home had four sets of very tall patio doors with minimal space to install bespoke curtain rods above, and hang curtains or blinds. 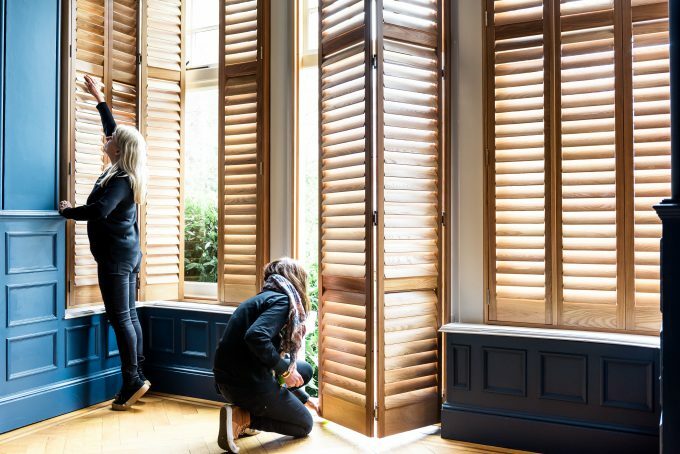 With our shutters being bespoke to every window and renowned for being easy to maintain, we were excited to give these doors a new look with our shutters. Full of natural light, this space was a dream to photograph. 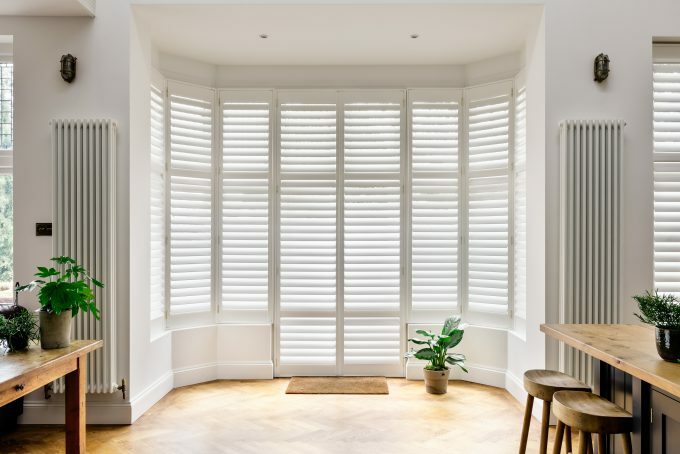 We fitted our full height Classic Poplar Wood shutters in Bright white to the room to make the most of the light and give a clean minimal look. Generally, the larger the slat size the more space between each slat and thus the more light. We opted for our largest slat size, 89mm, to allow the most light possible to enter the living area. Shutters are easy to clean and don’t absorb smells in kitchens like fabric window dressings can, and opting for this larger slat size offers even more space to get a feather duster between. Important considerations for everyday living areas that can harbour a lot of dust. This is one of our favourite shots from the day. Get the look in your home: Full height Classic Poplar shutters in Bright white, 89mm slats, with hidden pushrods. 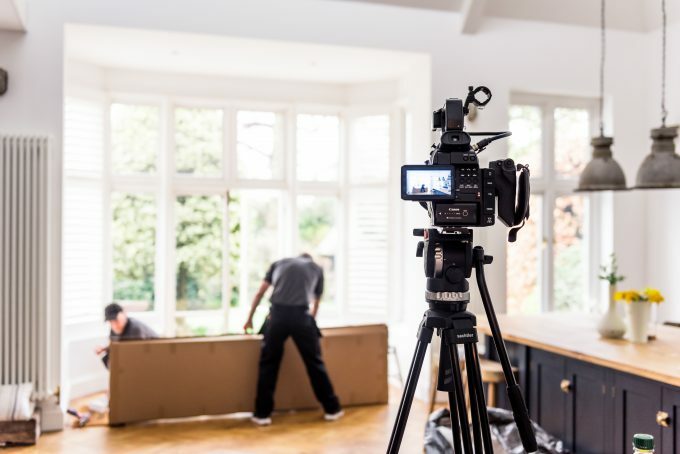 Curious about how we can makeover your home? 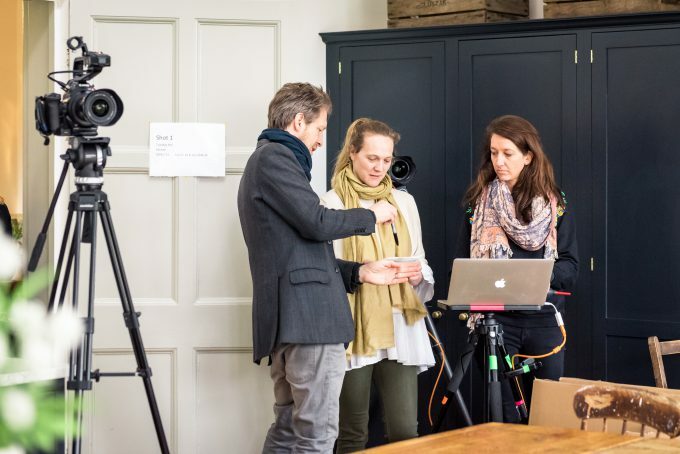 Book in your free consultation with one of our expert consultants today.